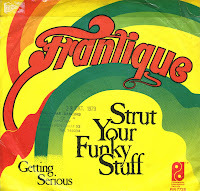 Frantique was an American disco group, formed in the late Seventies by Tricia Cheyenne, Florence Raynor and Denise Russelle. They released one album called 'Strut your funky stuff' in 1979. The title track of the album was successful as a single, reaching number 10 in the UK singles chart and number 16 in the Dutch Top 40. This copy of the single has had quite a tour around the three biggest cities of the Netherlands: the stamps on the sleeve and label of the record come from a bar disco in Rotterdam, and I bought it in Amsterdam. Now it's found a good home in the third biggest city of the Netherlands.